LIVERPOOL, Sporting Alert — Former Liverpool forward Christian Benteke returned to Anfield and dented the Reds’ Top 4 finish after scoring twice in Crystal Palace’s vital 2-1 win in the English Premier League on Sunday. Benteke was sold by Liverpool boss Jurgen Klopp in the summer and the Belgian came back to sting his ex-club with a brace that also helped Crystal Palace move further away from relegation. Liverpool took a first-half lead when Brazilian playmaker Philippe Coutinho curled in a brilliantly taken free-kick in the 24th minute to send the home fans jumping. 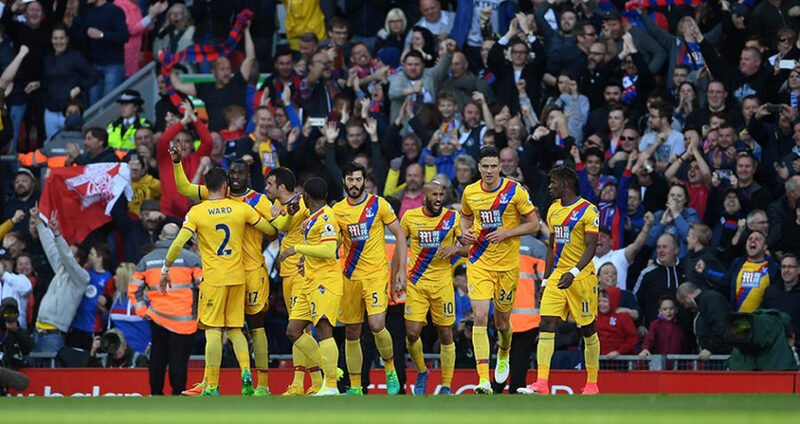 “Some goals you can’t stop and that one we couldn’t stop,” Crystal Palace manager Sam Allardyce told BBC Sport. However, Klopp’s men once again failed to capitalize on a lead and were left disappointed at the final whistle. Benteke found the equaliser in the 42nd minute when he fired home a left-footed shot into the top left corner. Sam Allardyce’s Palace grabbed the lead in the 74th minute when Benteke took full advantage of being left unmarked by guiding home the ball home from close range, following a corner kick. “The recovery from [the first goal] is good. Out of possession we frustrated Liverpool today so much that they had little opportunity to have a clean shot on goal,” Allardyce said. He added: “Liverpool were only as good as we allowed them to be. They had a lot of possession as did Chelsea and Arsenal. We did more with our possession than Liverpool and that is why we won. “We finished our analysis with how many goals Liverpool have conceded from corners. We showed that it might not be the first ball in but the second or third if we make runs in the right areas. Meanwhile, Liverpool boss Klopp was left disappointed by the defeat. “I have no idea how Crystal Palace are in the situation they are,” he said, speaking to Match of the Day. “We knew it was difficult. We were dominant, you cannot create 20 chances in a game like this, you have to work and that is what we did. Klopp added: “After you could see their confidence grew and in the second half we were dominant. They had counter attack threat but again out of nothing we gave them an opportunity from a corner. Defeat left Liverpool with the mounting of trying to hold on to a Top 4 spots, especially after Manchester United beat Burnley 2-0 earlier in the day and the likes of Arsenal and Manchester City were busy with FA Cup commitments. Klopp is staying positive, though. “It is frustrating, disappointing of course, everyone thinks the Champions League has slipped through our fingers but we have one more month to stay positive,” the German said. The victory moves Crystal Palace to 38 points and more away from the relegation battle in 12th place.